Hamilton police say that an anarchist book fair being held at a Hamilton high school over the weekend is linked to a vandalism spree that caused $100,000 in damages on Locke Street Saturday night. Hamilton police say they have linked an anarchist book fair held at a Hamilton high school over the weekend to the vandalism spree that caused $100,000 in damages on Locke Street Saturday night. In a news release issued Tuesday afternoon, police said they have received evidence connecting the two, but would not specify what that evidence might be. "I won't speak directly to the evidence," Staff Sgt. Mike Cunliffe said at a news conference. Around 10 p.m. 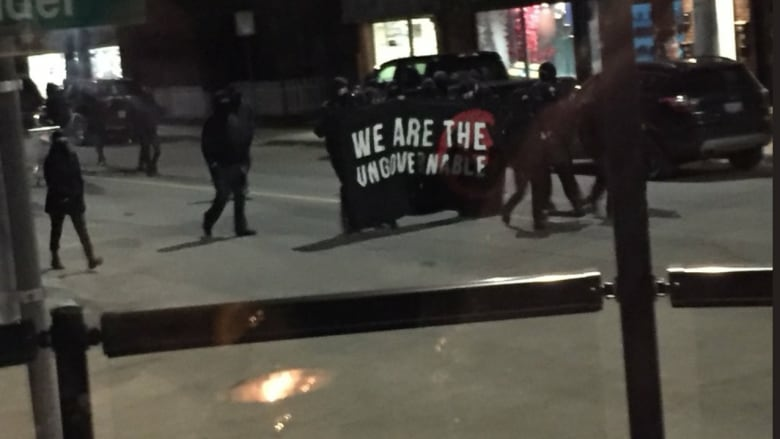 ET Saturday, about 30 people dressed in black with their faces covered walked through the streets of Hamilton carrying a banner that read: "We Are The Ungovernables." They set off fireworks in the Kirkendall neighbourhood in the city's southwest, police said, damaging vehicles and throwing rocks at store windows. Several businesses on Locke Street were targeted. Police are asking anyone living within a three-block radius of that area to check security camera video for any suspicious activity between 9:30 p.m. and 10:30 p.m. ET. "This includes any video that may show the individuals unmasked," police said in a news release. "Residents also may have witnessed large groups of people entering or exiting vehicles within the Durand Park or Locke Street area during that timeframe." At Tuesday's press conference, Cunliffe also touched on criticism from business owners on Barton Street, who say authorities have been ignoring their warnings about an escalating number of anti-gentrification vandalism incidents on the lower city strip dating back months. Some say it appears as long as these incidents were happening downtown or along Barton Street, there was no alarm. Cunliffe said four incidents of vandalism were investigated on Barton Street in the last year and all of them were concluded as unsolved. A new post on a regional anarchist blog may shed some light into the motivations behind Saturday night's riot. The anonymous post claims to be from a person who was involved in the incident. CBC News has not been able to independently verify the identity of the poster. 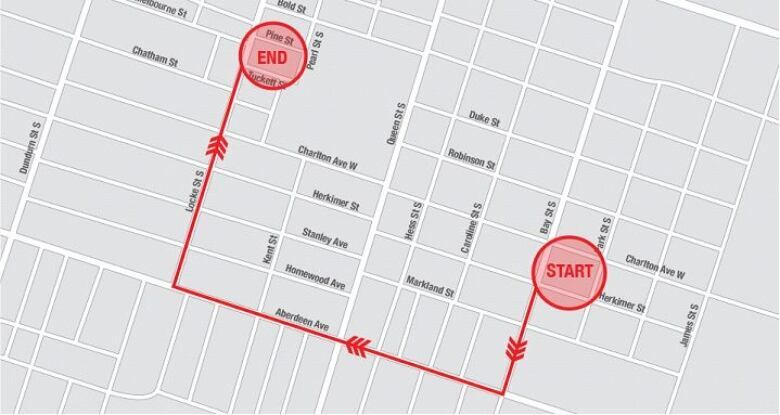 The post, written on the "North Shore Counter-Info" blog, describes the scene as a group of about 30 people moving towards Locke from the Durand neighbourhood at around 10 p.m. ET. "On Saturday night, I met up with a group of people in the Durand neighbourhood, strolled along Aberdeen and up some of the side streets attacking the luxury cars and mansions we found there, making noise with a portable sound system and loads of fireworks," the post reads. "The march then turned down Locke and attacked as many yuppie businesses as we could before deciding to disperse. The police say we ran from them, but I didn't see a single f--king cop after they were chased off up on Aberdeen. "To all the undoubtedly sincere and principled anti-capitalists on the internet who wonder why the Starbucks didn't get smashed but all the poor, sweet small businesses did, it's only because it was just a bit too far north. My one regret from the evening." Investigators have also said they are aware of the blog post. Insp. Paul Hamilton told reporters at a news conference Monday afternoon that he got a call about what was going on at 10:08 p.m. that night, while the crowd was moving down Aberdeen Avenue. Hamilton was stationed on the Mountain at Division 3 as the duty officer in charge at the time, so he was responsible for any major incidents in the city. He said at the outset that only a handful of police officers were on scene. He asked the officers if anyone was being injured in the area and they said no, that the protesters were just throwing rocks and setting off fireworks. "I immediately instructed that nobody is to engage them, until we get the proper resources in place that we can control the situation properly — because by intervening too early, we could escalate the situation," he said. Hamilton said he made his way down from the Mountain and within 15 minutes, had deployed 30 officers including officers from the ACTION team, a SWAT team, as well as police dogs and mounted units. By the time police got on scene, the mob had dispersed, Hamilton said, shedding clothing as they went to blend in with the crowd in the area that night. Some have criticized the police response, as no arrests were made. Hamilton, however, maintained the officers acted appropriately. "Two officers against 30 people isn't going to work out very well for them," he said. "They utilized their training, backed off to a safe distance, and called for backup, which is what they're supposed to do." 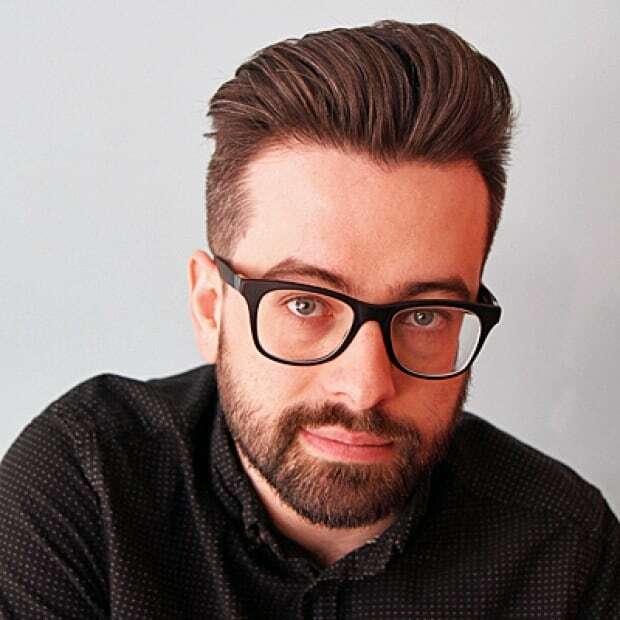 The blog post also goes on to talk about why small businesses were a target Saturday night, saying it "isn't the size of the business, it's that the relationship is exploitative." "They are getting rich because our lives are getting worse."